This summer Skatefresh are involved in an Arts Council funded project called Sound Currents in Walthamstow. This is the second year running Skatefresh has been contracted for this particular project. Children from 6-12 years from the borough have enrolled on the week long programs, learning and exploring a variety of different arts skills including inline skating, drumming, drama, singing, lyric writing, music technology and dance. Skatefresh is delivering a SkateDance project where the children learn to skate and then by the end of the week develop and perform a short skate dance routine. Maja and Asha from Skatefresh have been involved with the teaching, running 1.5 hour sessions several times a day, five times a week. Group sizes are about 15 skaters and luckily they are streamed into age groups. The emphasis is on fun and learning the basics (skating, stopping, turning). By the Thursday of each week, the children choose which activity they want to specialise in having participated in all of them during the week. 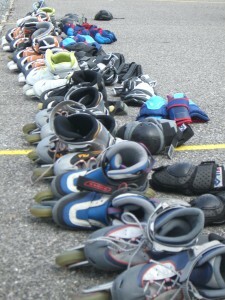 Inline skating always ends up being the most popular activity and the program organisers have great difficulty in persuading many children to take up their second choice activity as skating is always over booked. This shows how children just love to be outside, being physical, spending their energy and moving fast! The theme of the entire Sound Currents project this year was 2012 and with the children in the SkateDance group we decided to put together a dance routine based on the the Olympics. 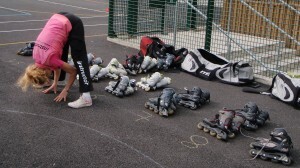 It was fun to see the children working out which Olympic sports would be best to act out/demonstrate on skates. These included running, basketball, hockey, javelin, discuss and synchronised swimming. Hurdles was ruled out as too dangerous! The final week of the project will be 23rd – 27th August. New Skatefresh instructors Jo and Alex will be observing some sessions first hand before they begin their mammoth autumn project of teaching skating at four different schools a week in after school skate clubs in Tower Hamletts. For health and safety reasons we cannot publish photographs of the children from this project or videos of their routines (a great shame as they are lovely).